If you love music, you’ve come to the right place! Music is important to us at UUCC, and we’d love for you to join us. Our congregation sings. We have adult and youth choirs. Our services feature fine keyboard music, as well as offerings by our talented instrumentalists, vocal ensembles and soloists. You’ll get to hear and learn more about all types of music, including classical, contemporary, jazz, gospel and folk music from around the globe. We value all musical traditions at UUCC. Our adult choir. Everyone with a love of music and singing is welcome to join. The Chalice Choir rehearses and performs from September through May. 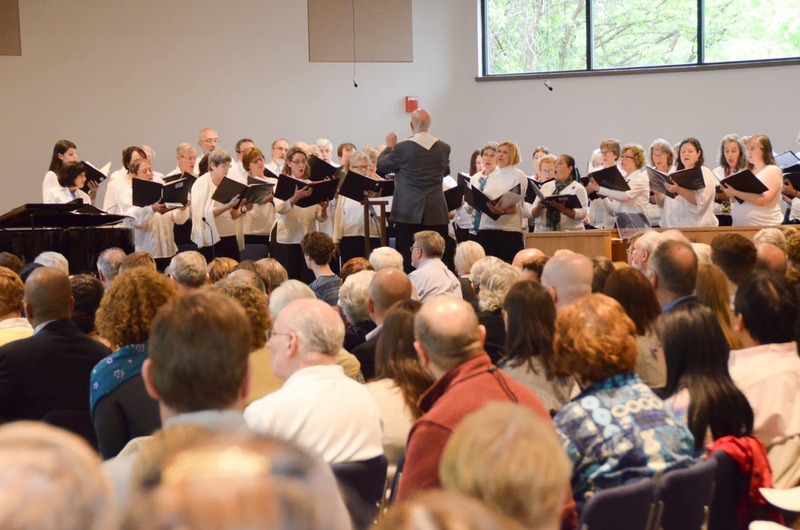 The choir sings at both the 9 A.M. and 11 A.M. Sunday services twice a month, participates in our semi-annual Music Services, and performs at other special events throughout the year. Rehearsals are Thursday evenings from 7 P.M. to 9 P.M., and before services at which the choir performs. For more information, or to participate, contact Tom Benjamin, Minister of Music. Our children’s choir. Everyone age 6-13 is welcome. Membership in UUCC is not required. 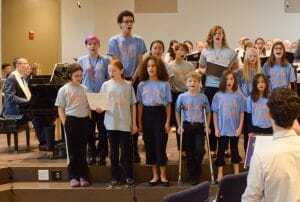 Our children’s choir works on vocal development and musicianship while preparing a variety of music for services. The choir sings about once a month between September and May. New members are always welcome. Rehearsals are every Sunday morning from 10:10 to 10:55, as well as before services when the choir performs. For more information, or to participate, contact Vickie Beck, Volunteer Director of Youth Music. Our select small vocal ensemble. This specially selected vocal ensemble specializes in Renaissance, as well as classical and contemporary choral music. The ensemble also performs a pop/jazz repertoire. For more information, contact Tom Benjamin, Minister of Music. Our select jazz band plays for occasional services, concerts, outreach, and special events. Our select jazz/pop vocal soloists (Chalice Chanteuses) and vocal ensemble (Chalice Singers) round out the program, performing jazz/pop classics, as well as music by our remarkable UUCC composers. For more information, contact Tom Benjamin, Minister of Music. UUCC has two regular concert series, the UU Chalice Concerts chamber music series, and the One World Coffeehouse, which features an eclectic blend of rock, pop, bluegrass, and other world music and other performances. UUCC Chalice Choir (led by Tom Benjamin, Minister of Music) leads the congregation in singing. 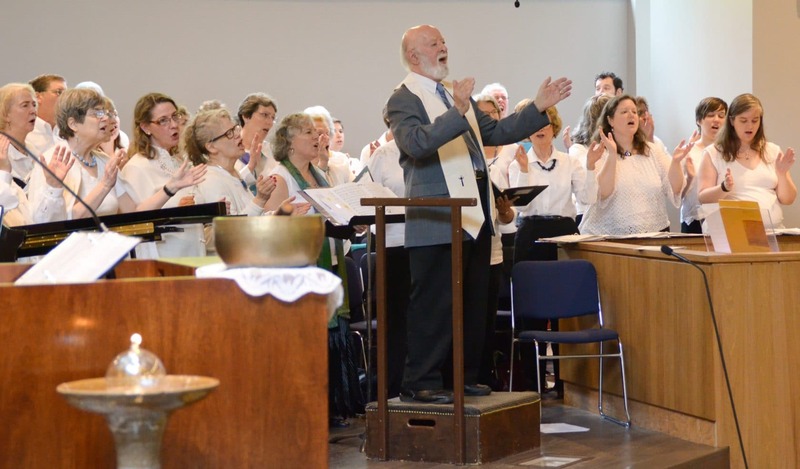 Our Music Ministry is led by a professional music staff, but at the heart of the program are the many enthusiastic and talented volunteers who sing with the choirs, perform at the services, and support the Music Ministry in other ways. Join one of our adult, youth, or multigenerational choirs. Welcome, musicians of all kinds, to our broadly-based Music Ministry. In addition to singing in our Chalice Choir, or playing in one of the ensembles, our musician members can also participate by playing or singing a solo in a service. We encourage talented musicians of all ages, both members and friends of UUCC, to enrich our services by performing special music, in any style and length that’s appropriate to the service, as approved and coordinated by the music staff. For more information, or to audition, email Tom Benjamin, Minister of Music, or Michael Adcock, Associate Director of Music Ministry. There are many ways to support our Music Ministry, such as joining a support team for the Chalice Concerts or One World Coffeehouse, bringing refreshments or helping out with a concert reception, or spreading the word about a musical event. Musical knowledge is not needed, only a willingness to help out. For more information, or to volunteer, contact the Music Executive lay members, currently Flo Wagner & Laurie Coltri.